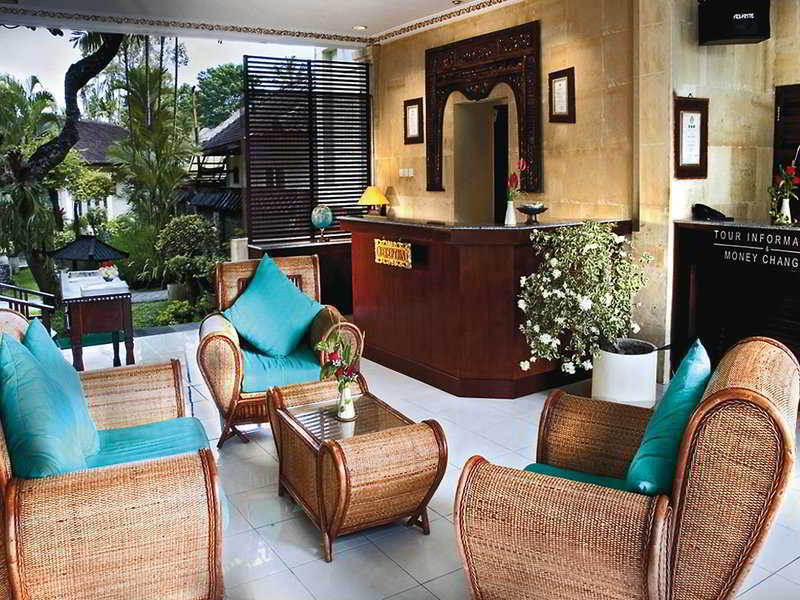 This hotel is located right on the sandy beach of Sanur, one of Bali's most popular areas. It is the perfect base from which to explore Bali, the famed Island of the Gods, known for its colorful and vibrant temple festivals, sun-drenched beaches, rolling surf, rustic villages and sculptured rice terraces. The hotel is surrounded by 70,000 m2 of tropical gardens with many mature trees and coconut palms. 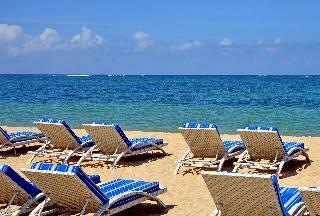 This beach hotel and resort is situated along the coral sandy beach of Sanur. Guests will find shops within 10 minutes of the hotel whilst the towns of Denpasar, Kuta and Ubud are a 20-minute, 30-minute and 45-minute drive away respectively. Ngurah Rai International Airport can be reached in approximately 30 minutes by car.The 32-room resort offers a unique amalgam of modern and ethnic elements along with a new-look minimalist style. Situated at the centre of Sanur Beach, it is strategically located for a convenient getaway from the hustle bustle of everyday life. Facilities include a hotel lobby with 24-hour reception, hotel safe, currency exchange facilities and a bar and restaurant. Room and laundry services are provided for a fee, and guests looking to explore the local area can hire bikes from reception (fees apply).The resort offers 2 types of accommodation: the new building is ideal for young spirited guests who love meeting fellow travellers. The bungalows are for those who like more privacy and solitude. The guest rooms feature facilities including hairdryer, direct dial telephone, satellite TV, minibar/fridge, balcony or terrace and individually regulated air conditioning units.The hotel features an outdoor swimming pool with sun loungers and parasols laid out by the poolside and a poolside snack bar providing convenient refreshments. Guests can also try their hand at some non-motorised water sports like canoeing (fees apply). 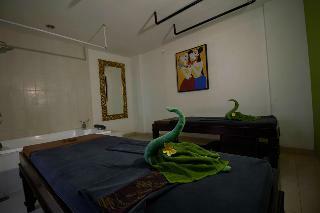 The resort also offers an in-house spa with massage and aromatherapy treatments (fees apply). Golf fans can head to Grand Bali Beach golf course, just a 15-minute drive from the hotel.Breakfast is served in buffet form. Lunch and dinner are available from a set menu or à la carte. "This charming club resort is located in the heart of Sanur village, Bali's most enchanting village. The centre of Sanur is just some 200 metres away and the city of Denpasar is approximately 7 kms from the resort. Denpasar's Ngurah Rai International Airport is 14 kms away. The rooms are tastefully appointed with a unique design that reflects the exotic culture and the island's environment. Featuring a classical traditional Balinese design, the resort's restaurant serves a wide variety of European, Chinese and Indonesian cuisine including breakfast, lunch and dinner, as well as snacks and drinks. Guests can choose their breakfast from an ample breakfast buffet and lunch and dinner are served à la carte. This resort shaded by coconut trees, with its picturesque view of Sanur Beach, offers the ideal combination of luxurious facilities and a charming Balinese atmosphere. " These contemporary villas combine classic Balinese style with modern comforts and superb service for a sumptuous holiday in Bali's Sanur district. 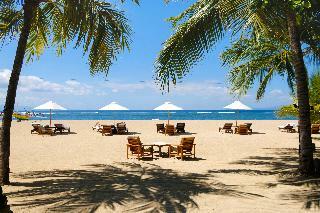 Sanur's famous Sunrise Beach is just a few minutes' walk from the villas, and Denpasar is within a 15-minute drive. The complex boasts the look and feel of a Balinese village with its pathways winding through tropical landscaped gardens. Each stylishly furnished villa features a living and dining area with a kitchenette and a luxurious private pool. The complex also offers butler service, a 24-hour front desk and room service for a more personalized experience. Guests can spend lazy afternoons lounging at the private beach club, where guests can enjoy exclusive complimentary amenities such as a sun lounger with parasol and a cold drink, all during a relaxing holiday in Bali. This hotel is located in Bali, lying at the heart of the friendly town of Sanur. 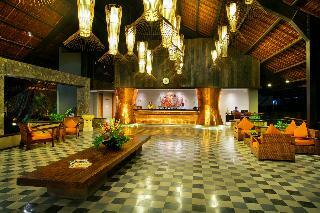 The hotel is located just a short driving distance away from Denpasar City and Bali International Airport. The hotel enjoys a stunning setting, immersed in the rich tropical splendour and natural beauty of the area. Guests will find themselves in a great setting from which to explore the attractions that the area has to offer. This wonderful hotel welcomes guests into the elegant surroundings of the lobby. The beautifully-designed guest rooms incorporate locally-sourced materials and a Balinese style. The hotel offers a wealth of exemplary facilities and services, meeting the needs of every type of traveller. This resort is beautifully located in Bali, nestled amidst the rich natural and cultural splendour of the area. The resort enjoys close proximity to a wealth of attractions in the area. The beach is just a short distance away, where guests can enjoy the ultimate relaxation and rejuvenation, surrounded by tropical beauty. This charming resort tempts visitors with the promise of luxury and style. The accommodation options are superbly designed, exuding tropical beauty and splendour. This majestic resort comprises a wide range of first-class facilities and services, attending to the needs of discerning travellers. This resort is sure to impress every type of traveller, ensuring a truly memorable stay. This resort is located in Sanur, lying just a 25 minutes' driving distance from Ngurah Rai International Airport. 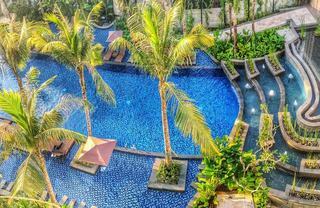 The resort is situated within easy driving distance from Kuta and Denpasar. 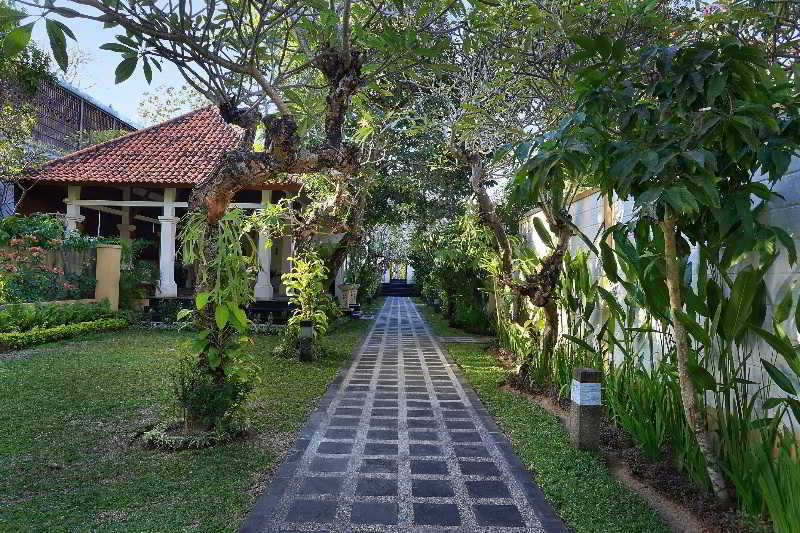 This resort is beautifully set amidst luxuriant gardens, on the Sanur beachfront. The resort comprises individual bungalows, which offer an exotic haven of peace and serenity. The bungalows are beautifully designed in a Balinese style, and are well equipped with modern amenities. The resort features a range of exemplary facilities, ensuring a comfortable stay. Guests are invited to wine and dine in the relaxing surroundings of the restaurant, where delectable culinary delights are the order of the day. This stunning establishment is located in Sanur, lying amidst the rich culture and history of the area. Guests will find themselves in a great setting from which to explore the area. The complex is located within easy reach of the area's legendary, sprawling beach, lying just a 25 minutes' driving distance from Ngurah Rai International Airport. This villa complex tempts guests into a world of luxury and charm. The complex beautifully showcases the uniqueness of a Balinese village, featuring a perfect blend of traditional and contemporary designs. The villas are sumptuously appointed, embodying tropical splendour and beauty. The resort offers a boundless choice of exemplary facilities and services, meeting the need of discerning travellers to the highest level of excellence. The charming Inna Grand Bali Beach boasts a spectacular setting surrounded by tropical palm groves on Bali's Sanur Beach. The provincial capital city of Denpasar is located just 7 kms away and offers guests an array of shopping and entertainment venues to be explored. 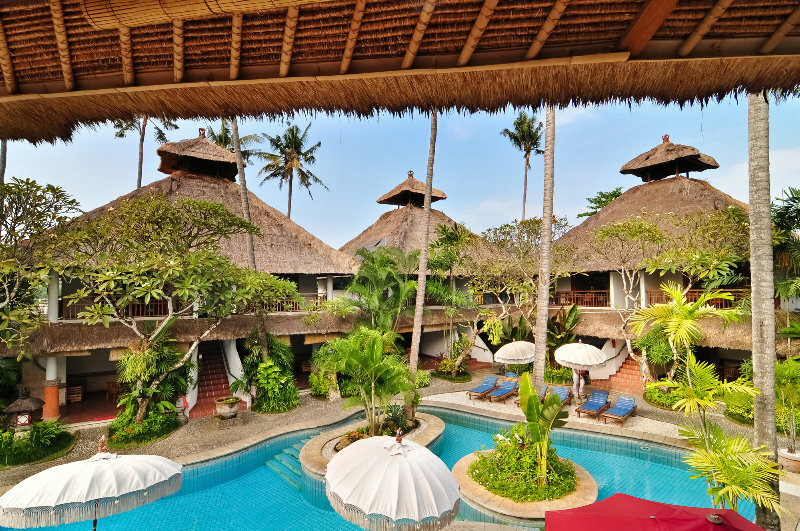 The energetic centre of Kuta is a mere 30 minutes' drive from the hotel and the airport is within driving distance.This attractive beach hotel comprises elegant Balinese style rooms and suites offering guests a relaxing haven away from it all. Guests are invited to relax in the swimming pool area with a natural backdrop. There are also table tennis, miniature golf and bowls to keep guests entertained. Dining options include a cafe bar, bar and several high-quality restaurants tempting guests with sumptuous culinary delights.